In the last post, I talked about a piano duo I’m writing. I focussed on melody in that post, but I’m going to talk about accent here. When you accent a note, you make it pop out of the texture. Regardless of what else is going on, that note becomes the thing that everyone pays attention to for the moment that it exists. So there needs to be a good reason to accent notes. A couple of common places to accent a note is at the beginning or the end of a phrase. Another is on the highest note of a phrase. Another reason (and the way it’s used in this piano duo) is to create an accent pattern. In this piece there are four accent patterns, one for each of the four hands. 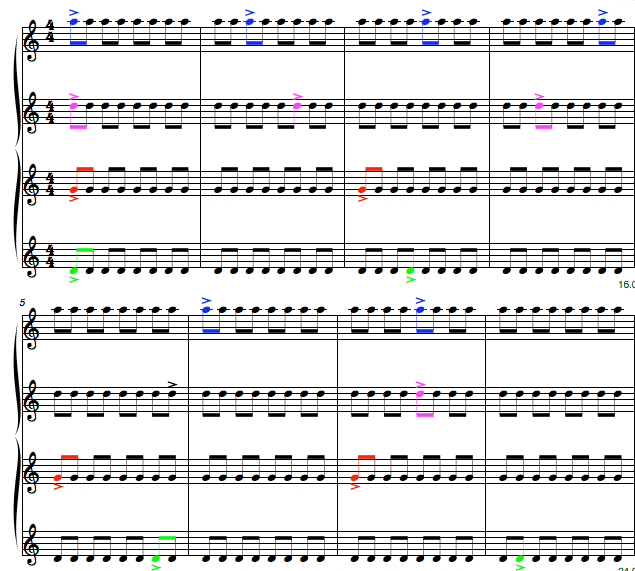 I use four-note chords for each of the four hands in the piece; I’m simplifying the idea here by using single notes. That’s the algorithm.The choice of 10 for pattern 1 is arbitrary. The other patterns get larger by 3 each time. Here it is in score format. These four patterns create a composite pattern. 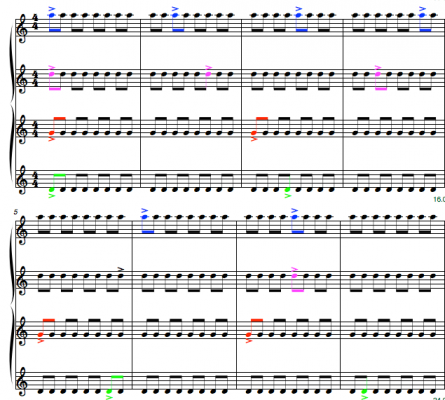 And here’s a version of only the accented notes for maximum clarity in terms of what the composite pattern is. Combine this idea with the melodic aspect discussed in the last post, and you can see the structure start to deepen. We’ve used melody and accent. What other parameters can you create patterns for?